Ulster Bank Downpatrick recently counted the pounds and pennies for Northern Ireland Cancer Fund for Children (NICFC) who are currently building a new respite centre for families called Daisy Lodge in Newcastle. 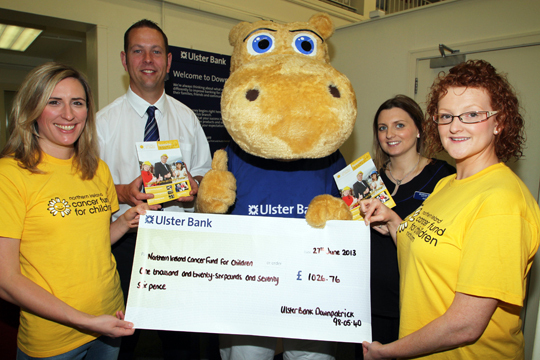 Staff members took part in a flurry of fundraising activity for the charity as part of Ulster Bank’s One Week in June campaign, which saw all 79 branches collecting money for NICFC. Among other things were Name the Teddy and ‘guess the number of sweets in the jar’ games in-store, a bun sale and the staff even got on their bikes for a static sponsored cycle inside the bank in Market Street. Pictured are Joanna Black, NICFC Fundraising Officer, Gary McAlpine, Ulster Bank Branch Manager, Henry the Hippo, with Louise McClean and Aisling Bell, Ulster bank staff members. Henry the Hippo from the Ulster Bank gives a thumbs up after an excellent fundraising effort by the staff for the Northern Ireland Cancer Fund for Children.